The three Aran Islands, Inis Mór Island (Big Island), Inis Meáin Island (Middle island) and Inis Oírr Island (East island) are situated at the mouth of Galway Bay. The islands are renowned for their geological formation, historical monuments and their linguistic and cultural heritage. The Irish language is still spoken here and in the twenty first century all native born islanders are bilingual in both Irish and English. The island of Inis Mór ( meaning the big island) is one of the most popular visitor destinations in Ireland. The island is very welll known internationally and is steeped in a fascinating history. There are over 50 different monuments of Christian, pre Christian and Celtic mythological heritage on the island. These tell a story of the inhabitants of the islands through the ages. The island’s most prominent monument is the world heritage site of Dun Aonghasa Fort which stands over a dramatic 300 foot cliff spanning the western part of the island and faces the wild Atlantic ocean. Others landmarks include the Black Fort, the seven Churches, St Benins Church at the southern tip of the island, Temphaill Chieran, and the old Light House at the islands highest point. Watch out for the puffing holes in the ground, which can fountain water on a turbulent day. Another geological fascination is the worm hole which is a large natural square hole in the ground beside the sea. The eastern side of the island has clear views of Connemara’s 12 pins mountain range. You can enjoy also some of Europe’s cleanest white sandy beaches with clear turquoise waters. The fishing port of Kilronan Harbour is popular with yachts in summer and is bustling with activity particularly in summer when there are numerous festivals taking place. If you enjoy the outdoors then this is definitely a place to spend some time hiking, fishing, cycling, swimming, sight seeing and just relaxing in the magical energy of the island itself. 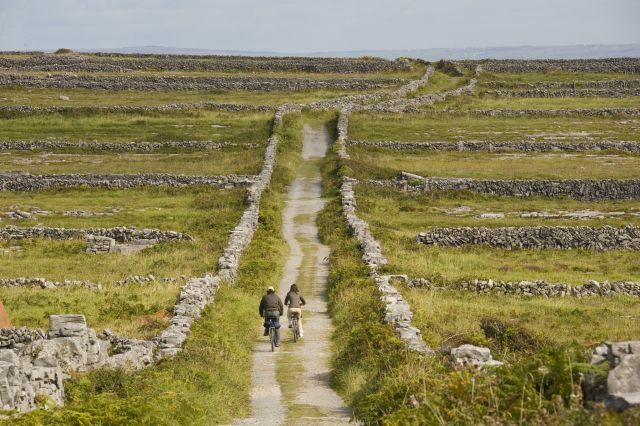 Inis Meain is the less visited of the three islands and can deinitely be a very authentic getaway from modern living. This island has an impressive view over the Cliffs of Moher. If you have an interest in the arts then this island may be worth a visit. This island was a retreat for Synge, one of the Ireland’s best know playwrights The island is home to a lot of artists and there are classes in dance & poetry to be found here. Inis Meain has also grown popular as a diving hub owing to its clear waters and abundant marine life. A name derived from “Inis Oirthir” meaning island of the east, is the smallest and most eastern of the Aran Islands. The entire island is less than than 3sq kilometres in size. Inis Oirr is a walkers paradise as there are so few vehicles. The scenery is breath-taking and there is much flora here that is unique to the island and the Burren area. Many species are extremely rare and are under conservation. If you want to walk around the full island – follow the hiking symbols on the sign posts. The full trail takes about four hours. The island is an isolated extension of the Burren Region of County Clare. You will see the same bare limestone pavement, rising at one point to 60m above sea level. The island has a beautiful long sandy beach with crystal clear waters. There is a lifeguard on duty here during the Summer months and the beach is perfect for swimming. Whether you are a fishing enthusiast or not, you should enjoy some rod fishing from the main pier or along the coast line at high tide. It is a super way to relax in these unique settings. Mackerel are the easiest catch during the summer and you are guaranteed to catch a couple for supper! Looking to play a few rounds of golf while you’re in Ireland? Check out Tourism Ireland Golf for all you need to know about our amazing Irish courses and the tours you can take to them.